"My beloveds and my children, I've come to you from holy land, from the holy city which is the heart of the world. It is the mother city of the world. I carry its fragrance and its spirit." - Sidi Said al-Jamal, may God be pleased with him. 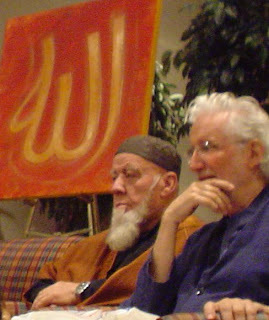 this weekend (12th to 14th Sept, 2008) sufi master of Shadhiliyya order from the holy land of Palestine, Sidi Said al-Jamal, descendant of holy Prophet, graced the gathering, "Walking Through the Stations of the Heart" workshop held at Del Mar, organized by Sufi Center San Diego. during the workshop other experienced teachers of the path and faculties at University of Spiritual Healing and Sufism offered resourceful and valuable sessions touching upon various aspect of sufi path including: Walking in the Sufi Way, Washing the Mountain of Existence, Metaphysics of Relationship, Healing in the Sufi Way etc. Sidi started his teaching by talking about the special month of fasting, ramadan. The inner meaning of fasting, true fasting, fasting as spiritual worship and healing of fasting. Among the teachings he offered was on true station of Isa Massih (Jesus Christ), Musa (Moses) and Ibrahim (Abraham), may peace and blessings be upon all messengers of God. About Jesus Christ, Sidi touched upon the topic, about the surrendered state of Jesus and also that of his blessed mother. One of the very striking concept he talked about how to become the Jesus of this time and how to become a true healer like Christ. Its worth mentioning that Shadhiliya sufi order is one of the most prominent contemporary sufi tariqa which carries the holy work of spiritual healing in the path of the prophets and messengers of God. Sidi calls Jesus as the master guide of humanity and beloved of the sufis. He reminded that around the table of Jesus many spiritual disciples were raised. Jesus carried the complete and true healing for humanity. Because of Christ's purity and connection with Allah, he was able to cure many diseases like blindness and even raising people from dead by the permission of Allah. He never claimed to do these by himself, but always referred that he did it as a favor from God. for all who love God. the essence of the secret love." Sidi talked about the secret of true healing for humanity. Jesus became so because he was raised under the shadow of Allah and walked towards the divine presence from his very first beginning just as God ordered him to do. If we want to become the true healer like him, we must have pure understanding of his holy life. 'Jesus is the divine center, for Allah has given all of his messenger, prophets and gnostics his knowledge. So the gnostics who know how to be and adorn themselves with godly qualities can heal through true healing.' Through true merging of our will with Beloved's will, through true surrender to the Divine Will one become Jesus of one's time. Sidi again and again emphasized about adorning oneself with the divine qualities. The prophets and messengers are the model for humanity who were adorned by the divine qualities, so their life and their living, their ethics teach one how to adorn oneself by it. Sidi prayed: "O Allah I direct myself towards You, and I ask You by the reality of Your Lofty Essence, by the reality of the presence of the great prophets Abraham and Moses, Jesus and Muhammad, I ask you please do not deprive any of us from spiritual happiness and bliss. Protect us and guide us so we can adorn ourselves with Your godly qualities, so that we can die carrying the message of unity. I testify, there is no absolute existence but Allah. Amen." the moment we arrive at the gathering we leave behind the ten thousand distractions of the world, like Moses when he entered the holy presence at Mount Sinai, he was told to leave his sandals behind, esoterically which signifies the passing world. the presence of the master is also entering a similar holy space. the presence of the teacher unfolds powerful process of those around him. i have seen people crying, weeping and sobbing just being in the presence with no words being transferred. in the process, for some, the soul's journey towards God is accelerated, for some deep washing of their spirit happens, for some their state of realization crosses few more thresholds and for some few veils are lifted by the grace of the teacher. reminds us of the Highest Presence. you'll find no earthly sense. what is one of the most beautiful aspect about such gathering of community is to be in the company of heart friends. when we finish our congregational prayer, we say peace to our right, to our left and upon finishing the prayer as we embrace other members, our hearts merge together and we experience the blessings that comes when two or more gather to remember and praise the Beloved. the people who gather are fellow seekers who's hearts are oriented towards the One and like in metal when all its micro poles are aligned to one direction it becomes a powerful magnet, similarly there is a powerful spiritual magnetic field that permeates the company of the heart friends whose hearts are oriented towards the grand pole of highest Truth. the climax of the 3 day gathering reaches it peak at the khalwa night or sufi vigil. in our gathering we did an one night long khalwa beginning after night prayer, continued till 4 in the morning. the word khalwa literally means 'emptying out' and the practice involves deep immersion in the remembrance of the Lord to the extent that it empty's one's mind of everything else. Sidi led the khalwa after leading the night prayer, followed by tarawih and witr prayer. for the remembrance, specific invocations were given to recite and meditate upon. during the khalwa one of the practice given to beloveds of Sidi (Sidi uses the term 'beloved' for his students and seekers) is to still the glance upon the arabic name of God: "Allah" written in white on black background. during this khalwa it was recommended to still ones eyes on the name for one hour, followed by putting the name in heart and in front of the mind while eyes closed for next hour. the practice has many spiritual dimensions including the esoteric power of letters. 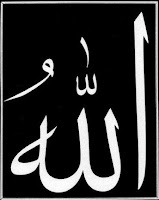 For example, ALLAH in arabic is written using four letters, Alif, Lam, Alif, Ha. Compare there are four stations such as station of the self (nafs), heart (qalb), soul (ruh) and secret (sirr). Also there are four stages: sharia (the sacred code of life), tariqa (the sacred path of walking), haqiqat (inner reality) and marifat (highest gnosis). Also there is this stillness aspect of this practice of gazing meditation which reminds of the psalmic commandment / meditation instruction: 'Be still and Know God'. After gazing, the inner beholding of the Name with mind and heart is a powerful visualization meditation. [>] Sidi will continue his travel to different parts of United States to visit and teach his beloveds. Check his tentative schedule and offerings for rest of this year 2008 in USA. Sidi invites all for 10 day Ramadan retreat (Sept 21 - Oct 1 2008) at the Sufi Center, Pope Valley, California. Click here for registration details.